When I read what the inspiration link would be on Gussy Sews for today, I thought forget it. I am a mom who is always trying to lose weight and refuses to buy new jeans until said weight is gone. 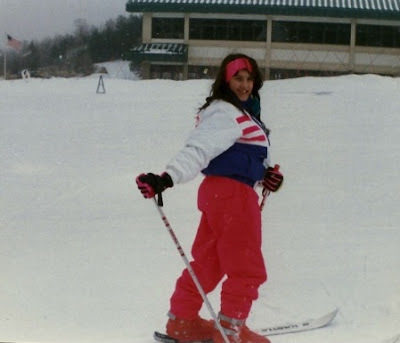 One of the first times we went skiing. Now this was a cool outfit. I was 12 and I was totally rocking that headband. I was never that good at skiing- it is a serious amount of work, but I would love to take the kids so they can try it out! 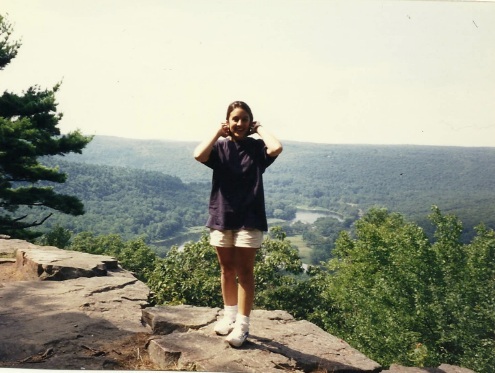 Age 13- on a vacation in Vermont with my family and my cousin's family. 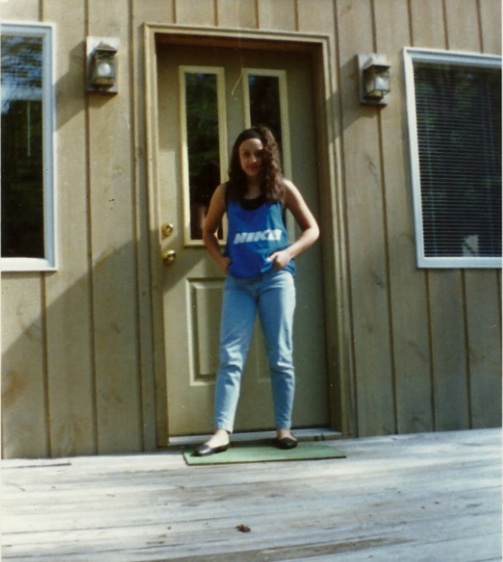 I loved wearing big tank tops over those bandeau tops that seem to be back in style. Though my mom got upset if I let the tank slip on my shoulder. We actually met Kirk Cameron and his brand new bride, Chelsea Noble on this trip! They were on their "secret locale" honeymoon and we happened to be in Vermont at the same time! This was a big thrill for us and we went home and watched Growing Pains. Someone has a picture of us meeting him, but I am not sure where it is. Polka Dots! Always my favorite- still is. 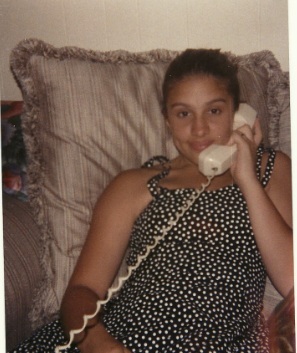 This was my 9th grade graduation dress and yes- that is a corded phone! Maybe you can show your kids- they have probably never seen one! Senior year- upstate camping! Short hair! I cut it up to my chin. I was so confident and thought I was so cool constantly putting my hair behind my ears! Maybe I could of bought my tee shirt in a smaller size? Those were the years before Aeropostale only sold fitted tees for women! What about you? Were you totally style savvy when you were young, but somehow lost your way? Tell me how "cool" you were. Anyway, you were super cute...and you're super cute now too, you know it? I know I've never met you in person, but from the pictures I've seen of you, I'd say you look a lot like you did as a teen! Judging from those styles I'm guessing your teen years were in the 90's? My teen years were during the 80's...let me tell you, the 80's were already an awkward fashion decade & being an awkward teen made that a very painful fashion decade for me! <--- cool girl. I remember wearing 5 scrunchies in my hair at one time, and wearing multiple socks at once, all covering my pants while wearing my doc martins (do they still make those). Got to love fashion and how it changes.